J.D. Neuhaus (JDN) has been manufacturing lifting equipment since 1745 and its pneumatic hoists are one of the safest and most cost efficient methods of pulling, lifting or lowering above or below ground where explosive atmospheres may occur. Immune to dust, mud, dirt, grit, heat, vapours etc. Ideal or use in mines, chemical plants, paint shops etc. 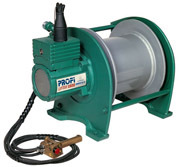 JDN Air Winches also available. Other lift heights are available.